The porch is a fun, relaxing area of the home. Passersby, potential buyers and guests alike all will have contact with the front porch; it’s one of the first places that they see when entering the home. The back porch is always in sight of neighbors, and it’s the main focus for guests who look out into your backyard. In places with nice weather, the front or back porch can be a great place to relax, get some fresh air, vitamin D and people watch. However, it can be very hot and sunny if no shade is provided. Umbrellas can easily break. A porch awning, on the other hand, provides a ton of benefits. 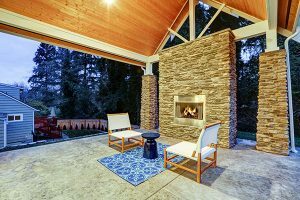 Read on to find out why porch awnings are great for your home. 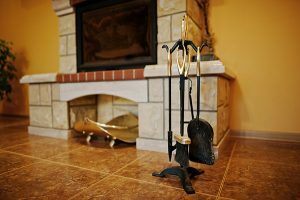 Most homeowners may not realize it, but warm air doesn’t just come into the home when the door is open. Heat also comes in by being transferred through windows and any structures, especially glass. The glass panes on the windows attract the sun’s rays and heat up; they then attract and transfer the heat into the home. The result is that your energy bill skyrockets as the air conditioning is forced to go into overdrive to make up for this extra heat. According to one study conducted by the Professional Awning Manufacturers Association, in certain areas like Texas where the heat can be extreme, an awning will reduce the energy spent on cooling by 50%, and in areas where the heat is somewhat moderate, it can be up to 25%. The reason is that the awning protects the glass and provides a sort of shade to the windows that are in the front and at the back of the home. An awning provides excellent shade not only for the glass but for the wood if you have a wooden porch or deck. Wood provides a timeless classic look, but it requires a lot of maintenance. In the heat, temperature fluctuations make wood expand; as the temperature gets colder, the wood then contracts. This constant expanding and contracting result in the wood warping over time. An awning provides some shade for the wood and protects it to a certain degree from such severe weather changes. It can’t protect it entirely, but it does provide some sort of protection. Nothing is better than sitting on the porch and enjoying some fresh air. However, exposure to the sun can be dangerous for our skin and can lead to certain types of cancer. An awning provides excellent shade without your need to worry about having to reapply sunscreen every two hours. Of course, it’s always good to wear sunscreen no matter what, but an awning does provide some barrier. For the elderly or those who are susceptible to becoming overheated, an awning allows you to be outside and enjoy the fresh air without fear of getting heatstroke. An awning is like a roof, front door or window in that it attracts the eye of those who pass by, and it can be highly customizable. Just like the front door can be painted different colors and come in a variety of styles and sizes, an awning can be chosen in alignment with the rest of the decor of your home. They provide visual appeal and should be streamlined with the rest of the look of the home. If you have more of a traditional feel to your house, you can opt for a solid muted color that’ll mesh well without being too bright. If you have a retro feel like many millennials prefer, you can choose a brighter color as long as it goes with the rest of the home. Patterns are also available, such as stripes or shapes, for those who really want to add some character to their home. 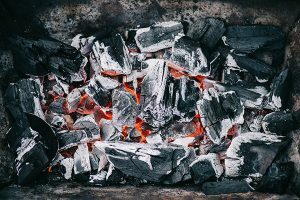 Every homeowner has experienced a time when they wanted to grill or had a party planned, and they had to cancel their outdoor plans because of rain. An awning allows you to keep the party going by providing shade from bad weather. In addition to protecting you, your wooden porch and the glass windows on your porch, an awning is an excellent way of protecting your furniture from the sun’s UV rays. The sun can fade your furniture. For example, on cushions or chairs, the colors will slowly begin to fade over time. It can also cause change in the colors in wood. Also, on top of the heat, snow and rain will eventually cause changes to furniture; all of the moisture may result in mold or mildew growing. 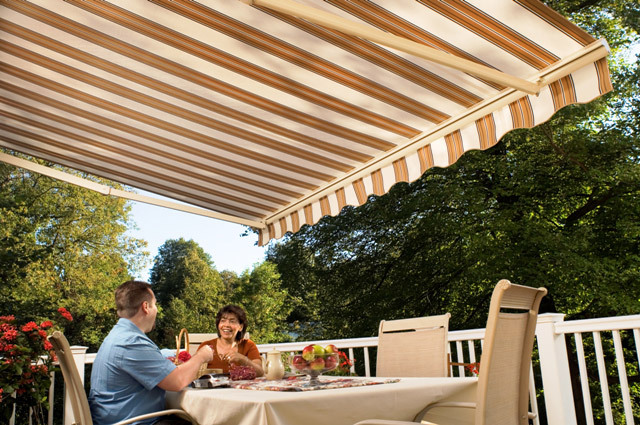 An awning will protect your nice patio furniture from the outside elements. There are a few different types of awnings. One popular type is the non-retractable awning, which can range in size and price. Some non-retractable awnings can be self-installed for those who are good with home repairs. However, it’s always a good idea to get a professional to do installations of home additions such as awnings since poor installation can be a safety hazard. A retractable awning is one of the newer inventions to become popular amongst homeowners. A retractable awning is able to be expanded or drawn back, providing even more options for your porch. A cheaper type of retractable awning is manual and works with a type of lever or crank. Another type of retractable awning costs a little more, but it is motorized. You can operate that awning via a switch. This is perfect for those who want to be able to control the awning from inside the home during bad weather, for example. An awning is a great way to add aesthetic appeal to your porch. 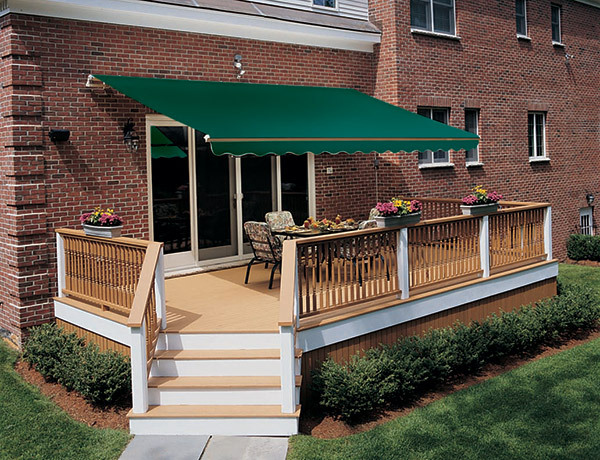 In addition to beautifying your home, an awning will also help to protect your porch and furniture from the elements. Rather than get damaged from snow, rain and heat, your porch furniture will get natural protection. Since so much heat is transferred from the sun through windows, an awning also will help to reduce the amount of heat that gets pulled through, helping your energy bill and the environment. All in all, porch awnings are a great investment for anyone wanting to enjoy the outdoors. For the best retractable awnings in the Chicagoland area, you can count on Early Times. 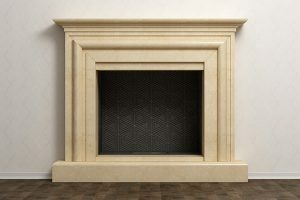 We have many different styles and colors to choose from to match your home – get a free quote now.